Take full advantage of the unlimited fuels! But note that it's until you fail to clear! Galaxy trio face off against dopey evil aliens who want to take over the universe. 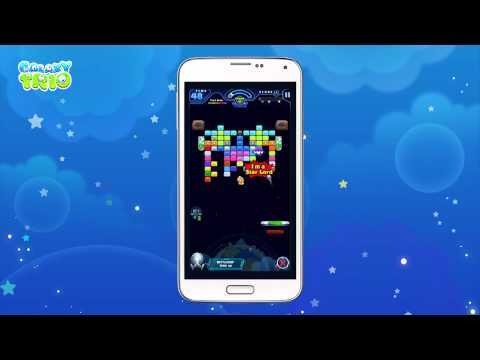 Powered up with plenty guardians this one-time million seller game came back as one of series hit to introduce you to a new plenty world of brick breaker! It’s time to meet the advent of new chronicle brick breaker! Now get on board to premium spaceship series to smash up your chronicle boredom for free! What will advent when a classic meets the future? What type of next chronicle will open? Simplicity becomes far more worthy with plenty contents. ★ Plenty Maps: 130 Normal stages and series of 7 Chain chronicle mode with parody themes from tv series. Find out what new plenty items and funny aliens are waiting for you at each stage and chronicles. ★ Missions: Complete stage or daily missions and get extra bonus! ★ Colorful Skills: Besides trios’, more plenty skills and effects are available in-game in series from guided missile, razor beam, slow impact, galaxy shield, barricade, to gigantic ball which not only help your play but also chill out with fantastic effects. ※ Please note that if you delete the app your game information including money, upgrades, characters, so forth may be initialized to zero. DEVELOPER INFO: Andromeda Games is a group of developers who have created universal game series including Maestia online, Tap Tap Blitz, Brick Breaker, chronicle of soul taker, GoStop since 2008.